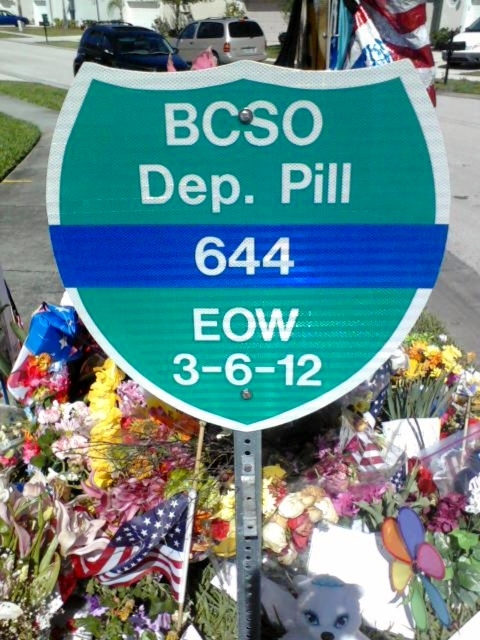 MELBOURNE, Florida -- The shield-shaped memorial sign marking the area where Deputy Barbara Pill was killed in the line of duty on March 6th, 2012 has been returned to the corner of John Rhodes Boulevard and Elena Way after being removed by the City of Melbourne. 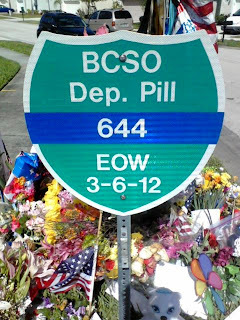 "Deputy Barbara Pill was savagely killed during the performance of her duties as a Peace Officer of Brevard County Sheriffs Office, Brevard County Florida, a Memorial was placed in her honor by kind hearted city employees who, as most felt a horrible loss from this horrific incident , this memorial is a reminder for all of us what Deputy Pill and every Law Enforcement Officer who wears a badge faces in their everyday duties." Lawrence had obtained 429 signatures on the petition by this morning.